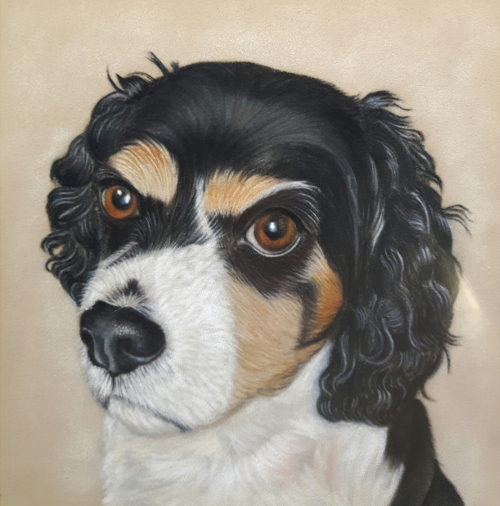 My daughter’s dog Mick, a King Charles Spaniel is getting very old now and I wanted to get a painted portrait for her for Christmas to remember him when he goes. I took a few photos specifically for the painting – the one we chose was perfect – just how we want to remember him. Laura loved the portrait and thought it was so realistic – the attention to detail brings the picture to life and captures Mick perfectly and I have shown it to so many people and they were so impressed. It was great to see the progress photos and have sent these to Laura so that she can keep them also – I was so confident that the painting would be perfect that I just left you to get on with it.